On Midsummer’s Eve, three role-playing teens dressed in eighteenth-century garb are shot in a secluded Swedish meadow. When one of Inspector Kurt Wallander’s most trusted colleagues–someone whose help he hoped to rely on to solve the crime–also turns up dead, Wallander knows the murders are related. But with his only clue a picture of a woman no one in Sweden seems to know, he can’t begin to imagine how. 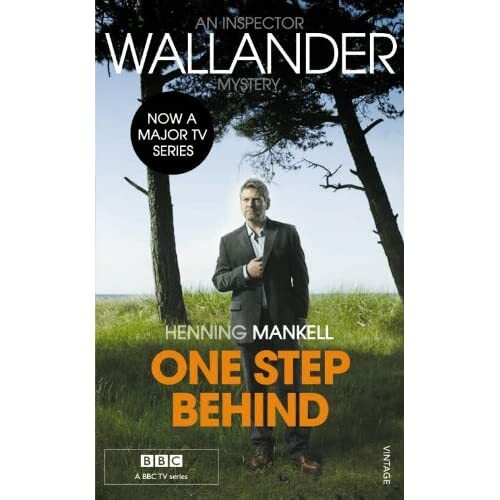 One Step Behind: A Kurt Wallander Mystery (7) by Henning Mankell is the seventh book in the international best-selling series about the Ystad detective Kurt Wallander. I’ve come a long way from practically loathing Kurt in the first book to really rooting for him now in this seventh book 🙂 The quality of the series has been up and down, but One Step Behind is definitely one of the good ones, and for me, it’s the best one I’ve read from all seven mysteries so far. Part of it I think is that the translation (by Ebba Segerberg) reads the best – there’s less awkward passages or odd phrasings this time around. In One Step Behind, Kurt Wallander is once again confronted with a serial killer, but unlike the avenging vigilantes that were featured in Sidetracked and The Fifth Woman (who only targeted victims who were themselves guilty of heinous crimes), the killer here appeared to have an unknown agenda against perfectly innocent victims. First, three young teenagers enjoying themselves at a Midsummer’s Eve costume party go missing (and later are discovered to have been murdered in cold blood), then a close colleague of Kurt in the Ystad police force is found shot at close range in his home. As Kurt and his team investigate, they find disquieting connections between the two seemingly unrelated cases – and as the tension and body count rises (together with public hysteria) – the Ystad policemen find themselves confronted with a canny killer who always seems to be one step ahead of the police. I do like how Mankell consistently captures the authenticity of a police investigation, the tedium of it, the overworked and overstretched police force, the politics involved with other branches of government, relations with the media, and finally, how everyone is re-energized by a new breakthrough (no matter how small). Like I said, many people used to the usual “exciting” crime fiction novel may be bored because of this, but I personally found it more fascinating. There is a lot of gloom and doom that I did find perplexing – the policemen act like Swedish society is crumbling into lawlessness (and that was back in the late 90s!) so I do wonder what the situation would be in our present time (I think the final book in the series is set in our time, so I’m looking forward to that). The eBook is also available at Barnes & Noble and the Apple iBookstore. I agree, this is one of the best: I enjoyed first the film and then the tv play. New Apps for the Kindle – Contacts and Tips for Kindle! New Apps for the Kindle – Task List Professional, Memory Classic & Crossword Games!